AISIN (Asco) World renowned for quality and reliability, AISIN Clutches hold the largest market share of parts supplied and manufactured for Toyota. This technology is incorporated into products supplied to other automakers as Original Equipment. By applying the knowledge and experience derived from OE manufacturing, AISIN Aftermarket parts are of equal quality and reliability. One of AISIN's unique and innovative technologies, the NVR (Noise Vibration Reduction) Clutch proves performance and environmental awareness can go hand in hand. The NVR clutch system has been adopted into the automotive industry as Original Equipment. 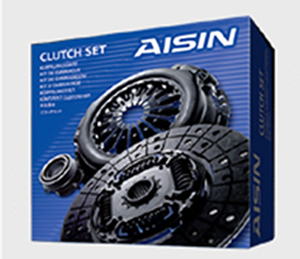 AISIN is a supplier to the following companies: Toyota, General Motors, Nissan, CAMI, Chrysler, Freightliner, Dynax, Mitsubishi, Johnson Controls, Trim Masters, Komatsu, Denso, TCM, NUMMI, Subaru-Isuzu Automotive, Saturn, Allison, LuK, Honda, NSK, Koyo. 16-210 New Clutch Kit: FedEx Toyota Hiace - 9-1/4 in. 16-211 New Clutch Kit: Pontiac Vibe Toyota Corolla Matrix - 8-3/8 in. 16-212 New Clutch Kit: Scion iM Toyota Corolla 1.8L - 8-3/8 in.